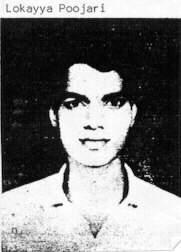 On the 20th February, 1987, a body of a youth (Photo on the right) was discovered near a depression in the ground at Alike, a small village near Mangalore in Karnataka State. The crowd collected, and the body was identified as that of Lokayya Pujari, a first year PUC student of the Junior College run by Satya Sai Lokashikshana Trust. This village incidentally is the centre of activities of Satya Sai Baba. An educational complex under the name of Satya Sai Lokashikshana Trust, with a primary school, high school and a junior college are being run by this Trust. The trust owns the land and buildings while the expenses of the institution are taken care of by the state government, being a state aided institution. Thus at the expense of the state, the Trust carries on the cult activities of brain washing the students to believe in the godhood of Satya Sai Baba. The body was later confirmed as that of Lokayya Pujari's by identifying the clothes he was wearing and also by the fact that he was missing for the past two days. The body was charred, and it was lying on its back, and underneath the body, the handle of a bucket and his half burnt clothes were detected. Around his neck was a chain with a pendant with the picture of Satya Sai Baba. But, all the divine powers of the Baba could not save him from a premature end! Immediately the authorities of the Trust swung into action to label this as a case of suicide by influencing the top official who also was a great devotee of the Baba and one of his children was an old student of the school. People asked pertinent questions as to how the incident went un-noticed when his companions were asleep only a few yards away if he had set himself on fire. There were no answers. In fact, the body was found only a few yards away from the cottage he resided, which was occupied by atleast half a dozen students. It was surprising that none of the residents heard any noise. Another question was, as to how a student like Lokayya, who was also a President's scout, could commit suicide? Financially, his family was not very badly off, in fact he had about Rs.300 cash with him. Attempts were made to contact his father and also to cremate his body. However, due to the insistence of the people, the body was not cremated, but buried. 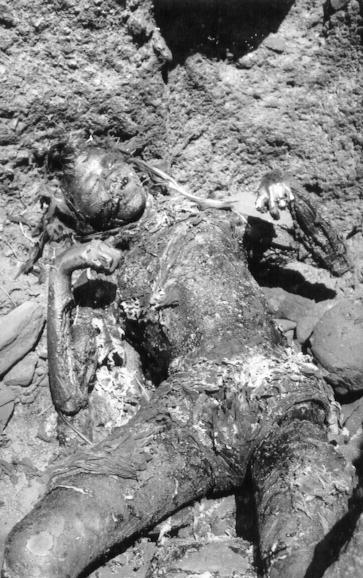 It was strange that only front portion of the body and the face were got burnt. There was absolutely no sign of the struggle on the ground, which would have been there if he had tried to commit suicide by burning himself with kerosene. When this news spread the local citizens rose up in arms against this injustice. This was not the first case of the Trust management trying their stunts. A few years back, the management suddenly stopped the admission of the girl students. This being the only one, in the area, this action would have deprived the local girls of an opportunity to get education. 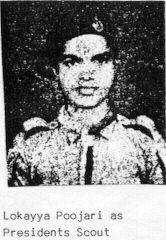 The prurient attitude of Satya Sai Baba found that educating boys and girls in the same class-room would cause distraction. Anyway the sustained campaign of the local people and the support by various progressive forces of the district finally forced the management to open seperate classes for girls. Though the lands and the assets had been donated by the local people, no opportunity was given to them to express their opinion. One of the local land lords, Sri Madiyal Narayana Bhat was a great devotee of Satya Sai Baba. A few years back he died of a car accident while he was on his way to the Baba for discussing the arrangements for an impending visit of the Baba. Bhajans were conducted around his body in the hope that the All Powerful Baba would resurrect him from death. Baba's powers did not work and so he was later cremated. This incident shook the Baba so much that his visit to Alike was cancelled! Though a devotee of the Baba, Narayana Bhat was quite reasonable in other matters and it was due to his work that the Trust was functioning quite well. With his death all sorts of trouble started. The agitation of the local people was suppressed with the help of the police. Finally, a hunger strike in front of the police station became necessary before a case of un-natural death was registered. An anonymous letter addressed to the police stated the circumstances leading to the death of Lokayya Poojari. Lokayya Poojari was a quiet boy, always in the good books of the management and very anxious to please them. One day when all the teachers were away some students had brought meat and liquor to the campus and had consumed the same. 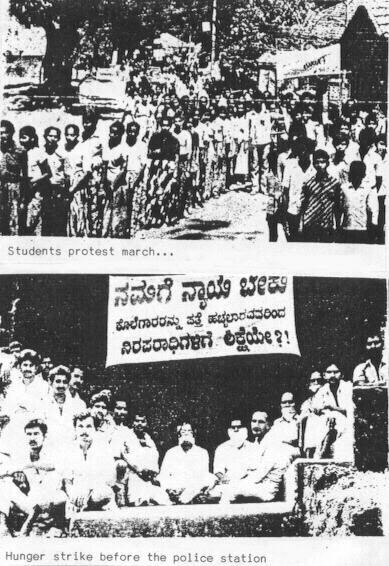 Lokayya Poojari had faithfully reported this matter to the authorities and as a result some students were suspended. When they rejoined, there was an argument between one of them and Lokayya which led to fisticuffs. The warden had conducted an inquiry into this and in the course of enquiry, had hit Lokayya. Lokayya had collapsed and died on the spot. The warden and others who were involved in the interrogation took the body and poured kerosene and set it on fire to hide their guilt and make it appear as a case of suicide. Lack of a note and the circumstancial evidence do not support the death as suicide. But, the influence of Satya Sai Baba could make it appear so. There was another allegation that the Baba and his inner circle members use the students for homosexuality and that Lokayya had caught them red handed and the murder was committed to get rid of the evidence. Due to the strong public opinion, the state government conducted an inquiry by the corps of detectives, but the results did not lead to anything. The powerful force around the Baba got the inquiry turned into a farce. Recently the Trust has shown its intolerance in another way. The present Principal of the Junior College is due to retire in April 1988. The next candidate according to the roster system maintained by the government is a scheduled caste candidate Sri Dundappa L.Bangode. Hectic efforts are being made by the management to keep this gentleman out of the race as it would be anathema to them to have an untouchable as the head of their college. Death of Lokayya Poojari is not the only one to take place in this campus. Every year lots of incidents happen. But most of them go unreported, thanks to the clout of the Baba with the government and the local police. It is time that detailed inquiry is conducted into the sordid affairs of the Sri Satya Sai Loka Seva Shikshana Trust, Alike, Dakshina Kannada District, Karnataka State and other educational institutions run by Satya Sai Baba. Let us see if the law and justice is same for every citizen of India irrespective of their status, influence and money.